As most of us learned in school, the audible range of sounds is 20-20,000 Hz (or less if you’re a partially deafened rock ‘n’ roll curmudgeon like me). 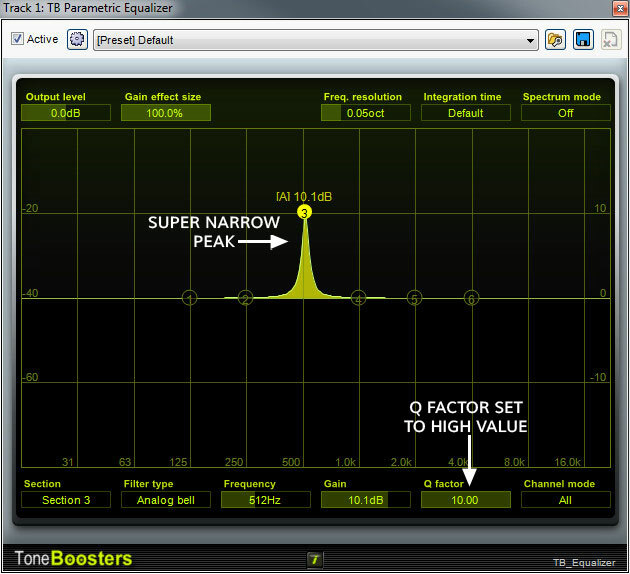 EQs are used to boost or cut audio frequencies in order to tailor sounds in a mix. 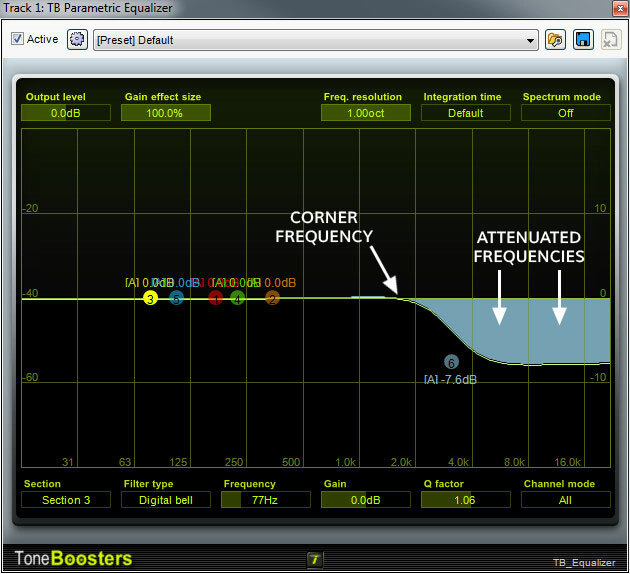 Boosting frequencies can fatten thin tracks or brighten dull tones. Cutting frequencies is often used to fix issues such as boomy bass, unpleasant ringing, or harsh, cutting high frequencies. It’s important to understand that EQs almost never affect only a specific frequency, but instead boost or cut a region of frequencies around the selected frequency. Certain EQs feature a bandwidth control, allowing users to set just how wide a “swath” of frequencies are affected; more on this later. One good way to think about EQs are as a frequency-specific volume control – in other words, when an EQ boosts or cuts a frequency range, it’s adjusting the volume of a certain region of the audio bandwidth. 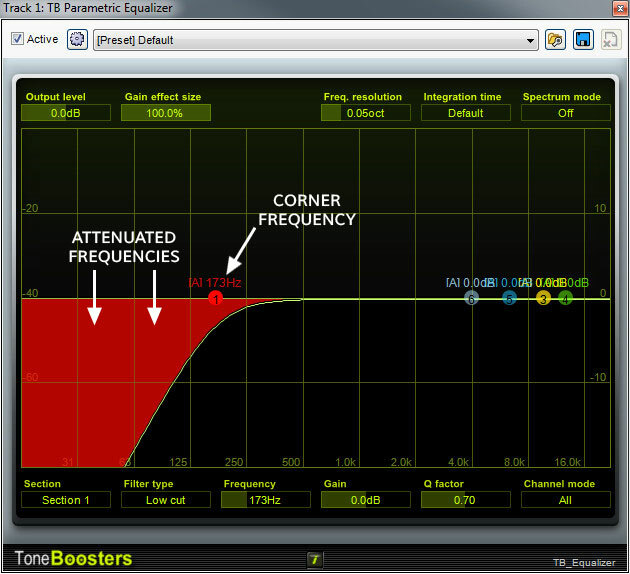 Let’s talk about the different kinds of EQs and exactly how they affect audio signals. 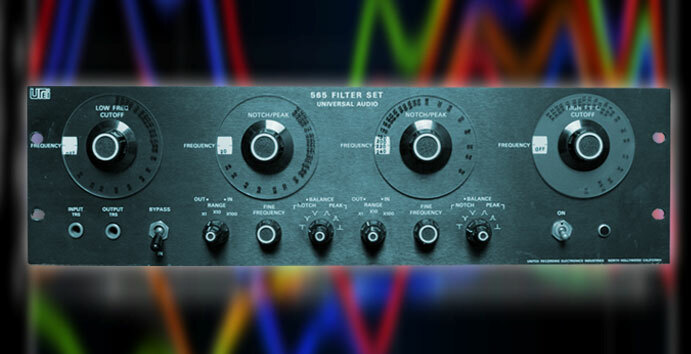 You may have heard the term “lowpass filter” in conjunction with classic analog synthesizers. This is because analog synths utilize a lowpass filter to shape the tone of harmonically rich basic waveforms by removing upper harmonics, commonly known as “subtractive synthesis” (we’ll get into this deeper in another blog entry, oh yes we will :P). See how the curve rises around 126 Hz? In this case, 126 Hz is the initial or “corner” frequency, because all frequencies beneath it are boosted (or cut) nearly equally, hence the flat “shelf” profile. In a basic “one-knob” shelf EQ, the corner frequency is fixed and only the amount of boost or cut is user adjustable; most versions intended for pro audio (that’s us) let the user set the corner frequency. 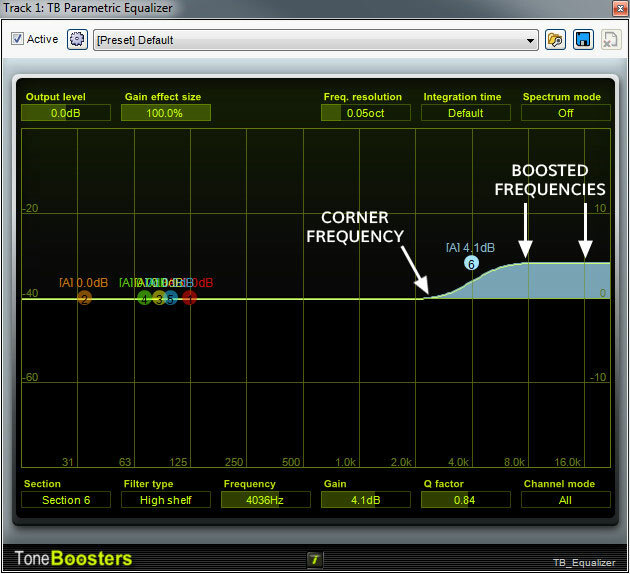 See how the boost and cut profiles are far more pronounced near the corner frequency? 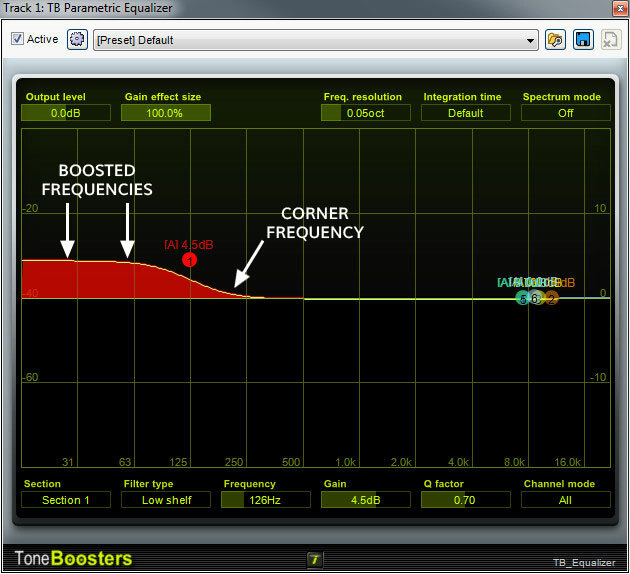 This gives a little extra push to kick drums or bass guitar near the corner frequency. Below is a high-shelf EQ. This works exactly like a low-shelf EQ, but the corner frequency is far higher, and the boost or cut happens above the corner frequency. In the graph below, I set the corner frequency around 4000 Hz. Parametric EQ – A semi-parametric EQ lets the user select the exact center frequency for cut and boost, but the bandwidth is fixed. A fully parametric EQ adds a bandwidth control (often called “Q”, perhaps the inventor of modern EQ loved James Bond). This means the user can adjust frequency, amount of boost or cut, and how much neighboring frequencies are affected, making it the most powerful type of EQ (most virtual plugin parametrics include are fully parametric; semi-parametrics are typically found in budget hardware mixers). 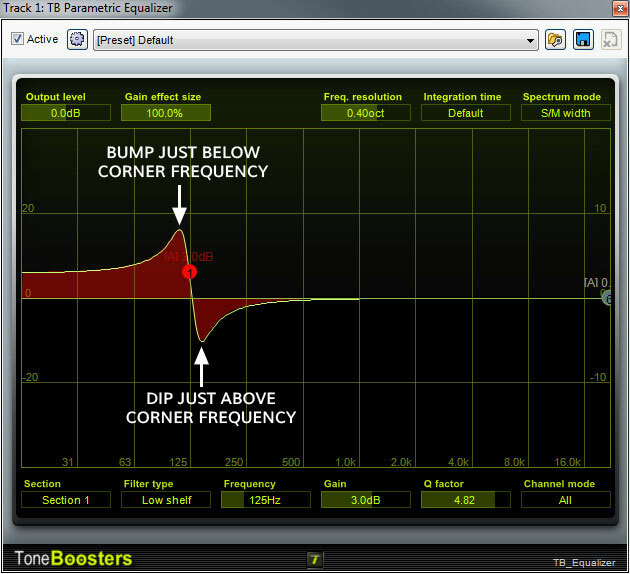 Parametrics are sometimes called “bell-curve” EQs, because the profile of the boost or cut has the rounded appearance of soul legend Patti Labelle. Ok, I made that up – their profile resembles an actual bell. Sort-of-ish. I didn’t make up the name. Full parametric EQ plugins usually include multiple bands with separate bands configurable as low cut, high cut, low- or high-shelf, or bell-curve parametric. All that EQ horsepower can be a little overwhelming, so I’ll offer some practical application tips. 1. Solo the offending track and turn the master volume in the room way down, so you don’t go deaf, blow your tweeters, and blame me for the whole mess. 3. Hit the play button – I recommend looping a small region. While listening, move the frequency control up and down slowly until you find the offending frequency. You’ll know when you’ve found it, because the exaggerated setting will ring loudly (hence the reduced volume). 4. Now that you’ve locating the ringing frequency, turn the gain control way down to a negative value and set the master volume back to normal. Ideally you’ll want the EQ gain low enough to eradicate the ugly ring, but not low enough to negatively impact the remaining sound. Here’s a video below. I actually dialed out two separate peaks to tame the snare drum, but it’s the same idea, just repeated twice. Notice that the higher frequency peak is almost exactly twice the first one, i.e. one octave apart. In the name of disclosure, I figured out the offending frequencies prior to making the video so you wouldn’t have to watch me poke around for four minutes – don’t worry if it takes a bit to figure out the frequencies! Also notice that I click and unclick the “active” box at the end to let you A/B with and without the EQ. One important thing to remember is that narrow Q EQ doesn’t usually sound pleasant or “warm”. Wide Q settings sound far nicer for more general tonal changes such as fattening guitars and snares in the 100-300 Hz range or kick drums around 100 Hz. Instruments can be brightened anywhere above 1000 Hz, but be careful and selective with boosts in the 2000-4000 Hz range, because this is the dreaded “icepick” area that can hurt the listener’s ear. I often dip around 3000 Hz if a female vocalist is particularly strident sounding. Another important EQ tip is simply knowing where instruments sound good. For example, don’t bother boosting 80 Hz on a vocal, because humans don’t make any sound there – you’ll just be boosting low-end noise. Instead, think of “carving out” the important areas for vocals and instruments to sit and not clobber each other. I usually use low cut filters on almost every instrument in a mix with the exception of kick drums in order to prevent a buildup of low-end mud. Miked electric guitars can be especially nasty offenders here. Unless you’re recording down-tuned metal madness, there’s probably not much you want going on beneath 100 Hz. Electric guitars can also be particularly nasty in ear-scratching 2000 – 5000 Hz range, so don’t be afraid to apply a gentle, wide cut here (and don’t be afraid to tell your guitarist to shove it when he cries about it). This has the bonus effect of making vocals more audible. If you find yourself using five bands of EQ on one instrument, it’s either an inherently awful sounding track, or you’re seriously overdoing it. I’ve seen some terrifying amateur parametric craziness… users will commonly boost a bunch of bands simultaneously (this happens with graphic EQ as well). Remember my “frequency-specific volume control” analogy? If you’re boosting a ton of bands at once, all you’re really doing is turning up the volume knob. Louder always sounds better, so don’t be fooled, EQ sparingly. I’ll leave you with one last piece of EQ wisdom: “Cut more than boost, grasshopper” (pretty sure Mr. Miyagi said that, or Master Po, or maybe Master P, I get confused). A zillion tracks of boosted everything makes for a dense and congested mix. Some things don’t need any EQ to sit right. My most important EQ tips: 1) don’t let bass instruments become a thick, gucky mess, it’ll sound bad and the mastering guy will hate you, and 2) make room for the important stuff, like lead vocals, snare drums and solos by cutting frequencies in support instruments. Finally, mix and EQ in context, i.e. with everything playing, because the right EQ choices for instruments in a mix often sound funky (or thin) when soloed. This kind of sh*t is why I love Acoustica. These motherf**kers get that home brew guys like us don’t know all the ins and outs of their program or DAW’s in general, there’s no f**king elitist high level lingo, they f**king give you an easy to use DAW, then throw you some common problem solvers usually reserved for pro’s, and tell you how sh*t goes down. I love these motherfu**ers, Mixcraft might not be the best, but dammit, they work hard for you. They’re to the DAW world what Valve is to the gaming world as far as developers go. just want you to know that i appreciate your blog. i’m assuming and hoping that just because there aren’t a lot of comments, others like me benefit from your effort and advice. to back up what the well intended but fowl mouthed other commenter said, you present information in a way that is personable and understandable for anyone. Thanks you, $%^&*&*&ers (kidding). Between here, Facebook and MC forum, I get enough feedback that is seems I’m on the right track, but I’m always open to suggestions for entries. Thanks guys! Just wanted to say thanks for everything. I am not new to recording but I always learn something new from reading your posts. I also have to say that Acoustica is a wonderful company and MixCraft is an excellent DAW. I have 3 other DAWS, that cost way more than MixCraft but they have nothing over it. Thanks for the time you put in.